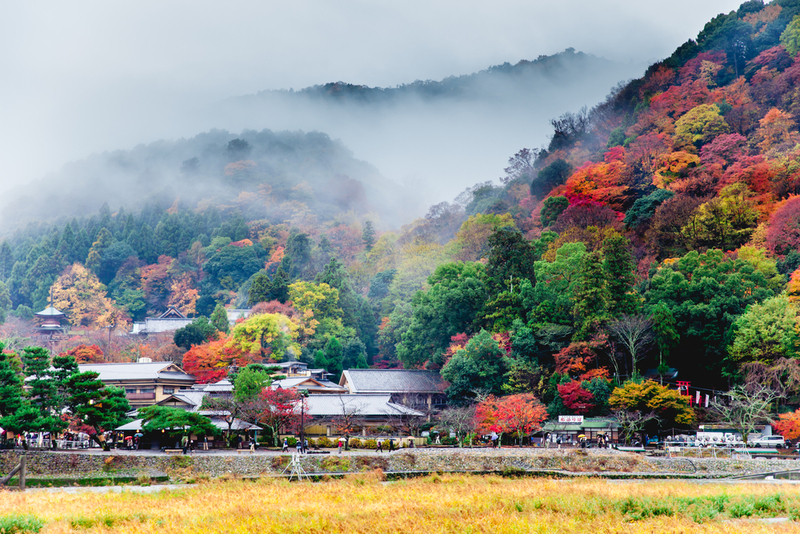 A very elegant culture was in flower in Heian period (794-1185), and since then, Arashiyama, situated in the far west side of Kyoto, became prospered as a holiday home place for aristocracy who charmed by the magnifique natural beauty. The nature shows its particular beauty in each season and the beautiful combination with the temples and the Katsuragawa river gushing out from the Hozukyo valley and the symbolic bridge across the river.... these elements of fantastic landscape are the ones that the aristocracy adored in that period. You will be fascinated by the scenary, too. 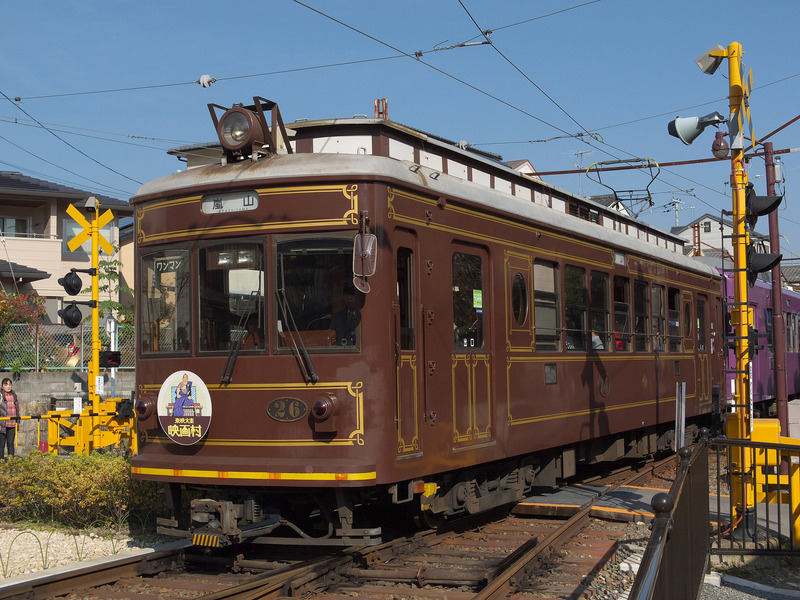 There is a tram named Randen loved by the local people in Kyoto. 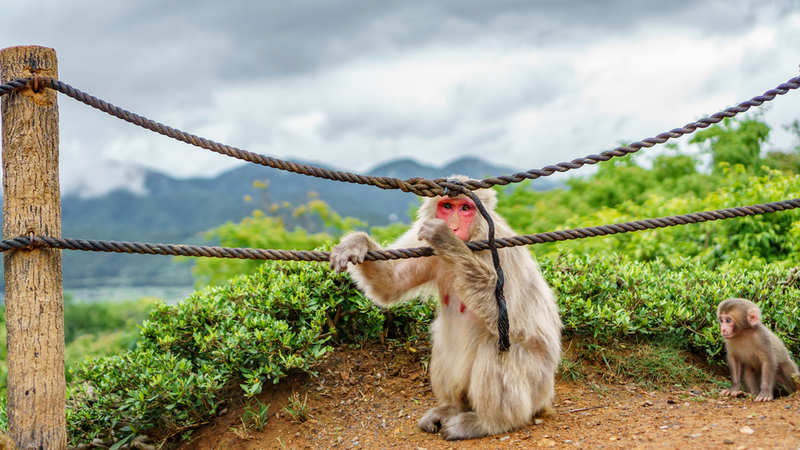 Taking the Randen and why not visiting the treasure of the Bouddhist cnstruction of 15th and 16th centuries, the Ryoanji temple and the Kinkakuji temple, which are registered as the World Heritage. The rock garden of the Ryuanji is renown as the master piece of dry landscape, and it is visited by the people from all over the world. 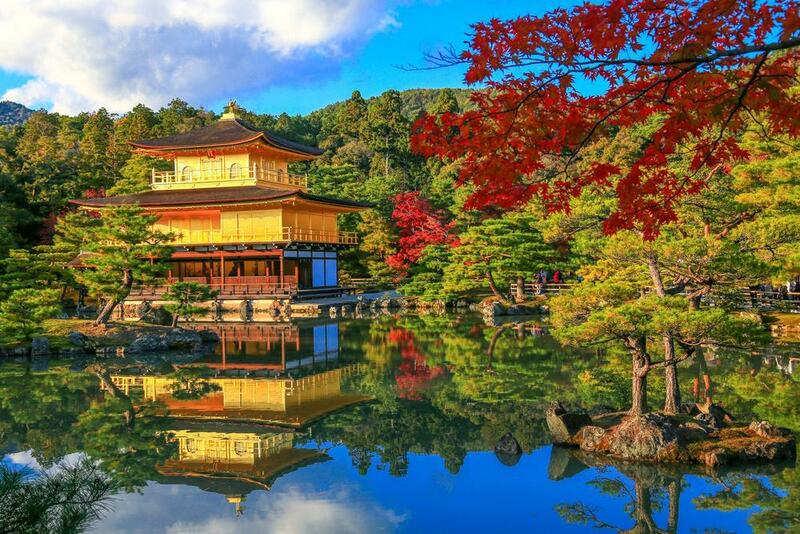 And the most luxury Bouddhist architecture, the Kinkakuji temple shining in gold, would be the place of interest. 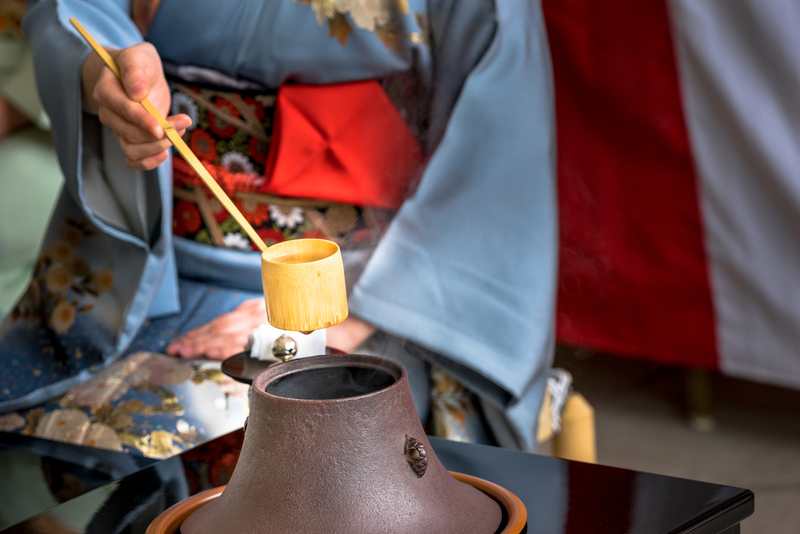 After visiting Kinkakuji, you can participate the tea ceremony which is an optional activity. It will be the wonderful opportunity of feeling the spilit of Japanese culture. Kyoto station　ー　Saga Arashiyama：　Nonomiya shrine　－　Path of bamboo　－　Tenryuji temple（World heritage/ entrance fee included）－　Togetsukyo bridge free walk（Arashiyama monky park: 550yen/ additional charges）　－　Lunch（option possible）　…　Randen（tram）…　Ryoanji temple（World Heritage/ entrance fee included）－　Kinkakuji temple（World Heritage/ entrance fee included）ー　Option：tea ceremony（45minutes）－　End of tour：The tour leader will guide you the bus station of each destination where you wish to go as Kyoto station or commecial district. Starting from Kyoto station, taking the tram and we are heading for Saga Arashiyama station. 1200 years ago, Kyoto became the capital of Japan and the Heian period is started where the aristocratic culture was bloomed. 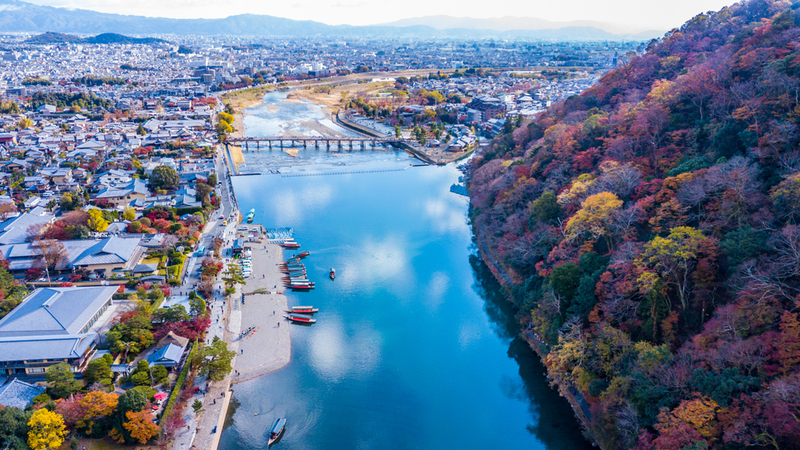 Since then, Arashiyama was started to be developped as the village of elegance because the aristocracy has chosen to build their villa and for strolling in this place. 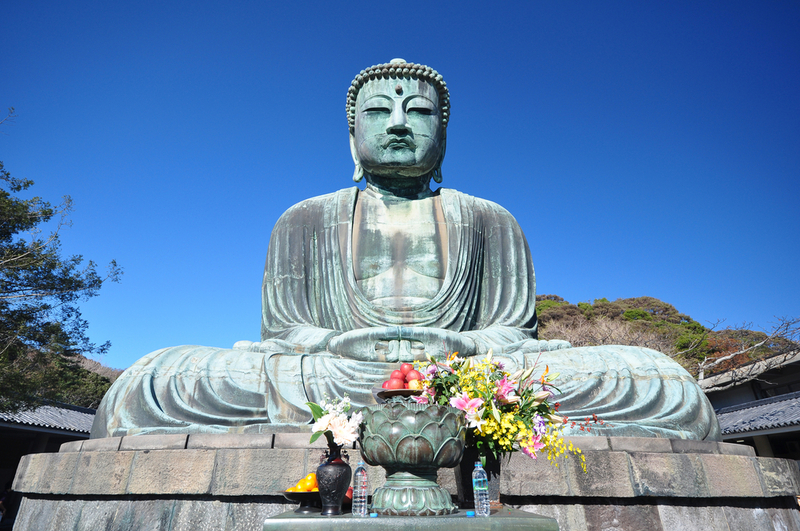 It has been only a suburb of the capital, but by the murmur of the stream of Katsuragawa river from the Hozukyo vally, and riches of the nature of all land, the aristocracy were fascinated and they have chosen this place as the most favorable place for building the temples to be concentrated in the stillness. Today, it is one of the best place of Kyoto loved by tourists, where you find today many souvenir shops and cafés, and it is a wonderful place for having many activities which allow the interesting experiences of the culture, and also for finding the beautiful nature of each season and off course, it is a good place for visiting the temples. 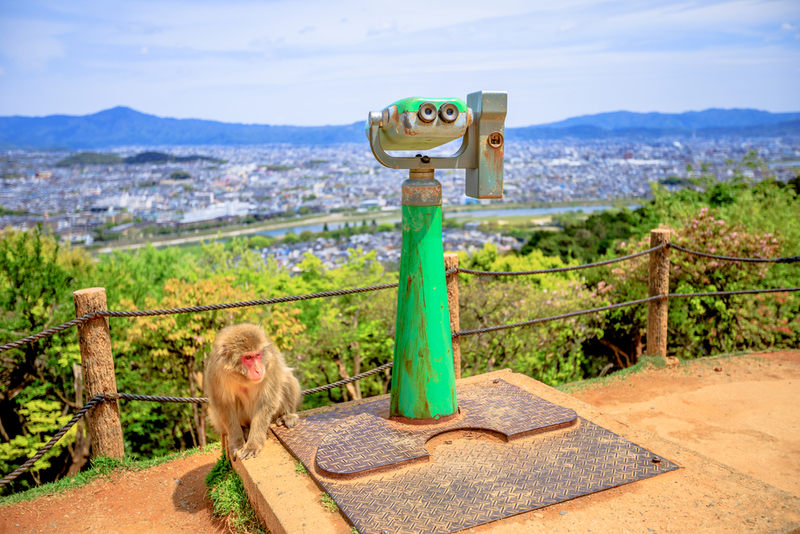 Walking aroud 5 minutes from Arashiyama station, we will arrive at Nonomiya shrine which is known for a match-making god. 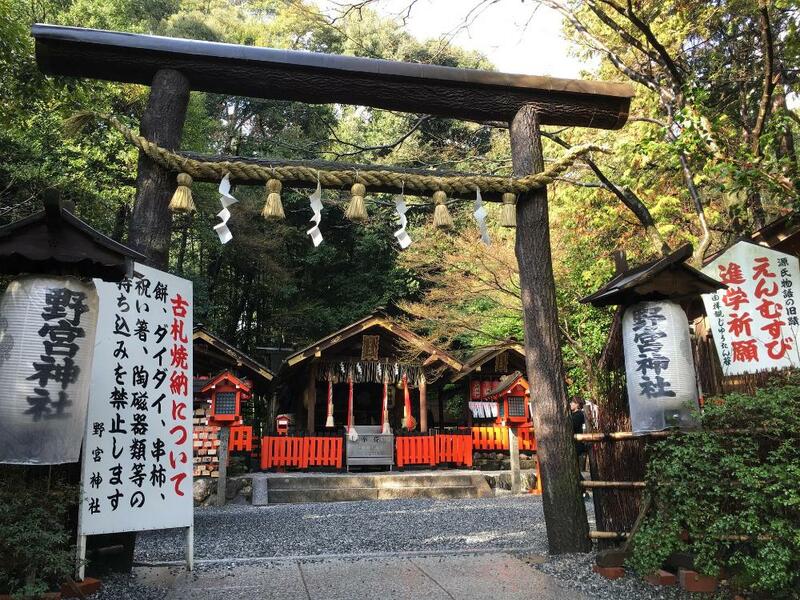 Nonomiya shrine is a small shrine of Shinto, but it is a historic sanctuary where the daughters of the noble family purifed herselves for being the Shinto maiden of Ise grand shrine. 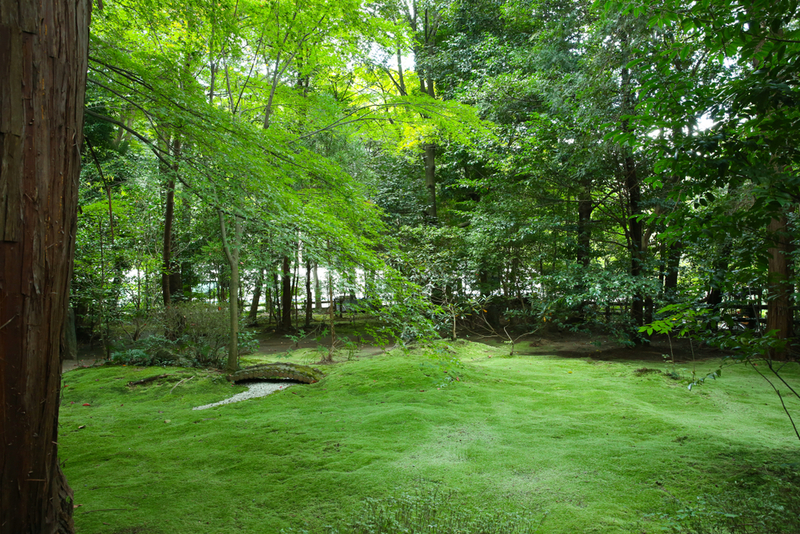 In the entrance of the shrine, there is a black torii gate in the very ancient style and a beautiful mossy garden and the Kameishi (turtle shaped rock) which realizes your wish in the centre of the garden. In the Tale of Genji, there is a discription on this shrine which made this place to be known as match-making point. The Path of bamboo starts from a side of Nonomiya shrine. 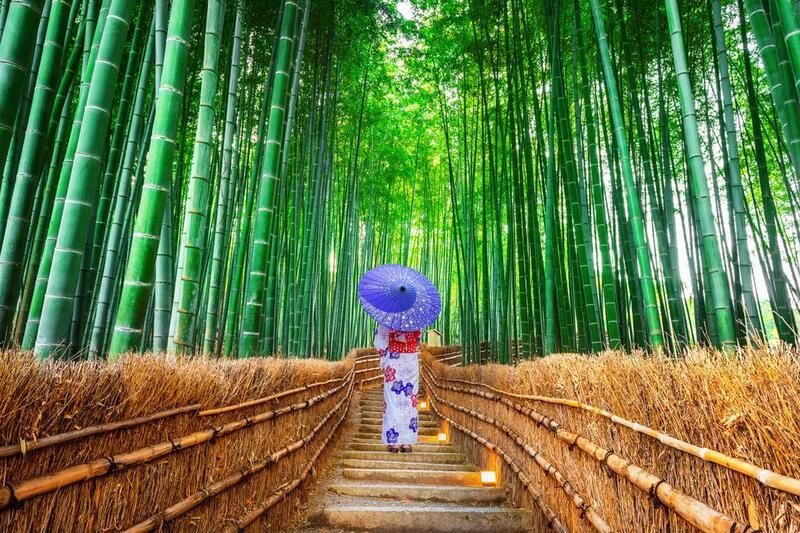 The Path of bamboo is a famous touristic place ans often mentioned in the television, in many magazines and guidebooks. It is a small charming path of 200m. 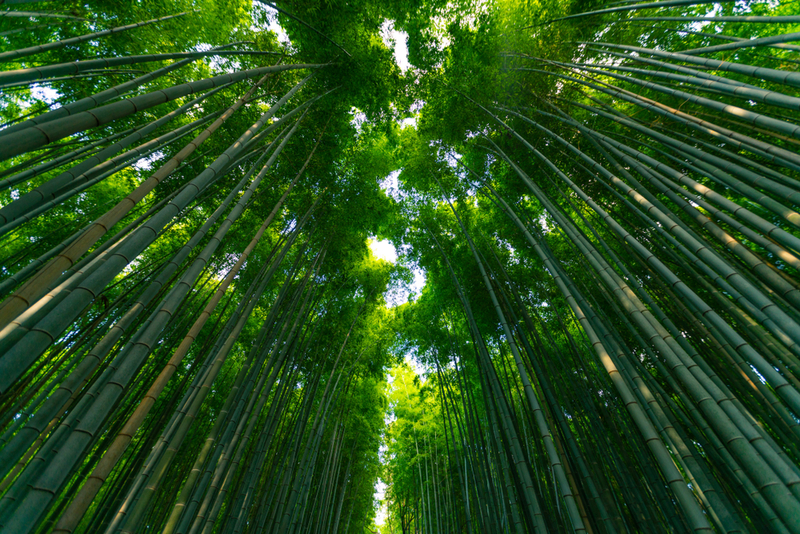 The bamboos are very high and they even cover the sky. The sunlights through the bamboos are very beautiful whether if it is fine or cloudy day. 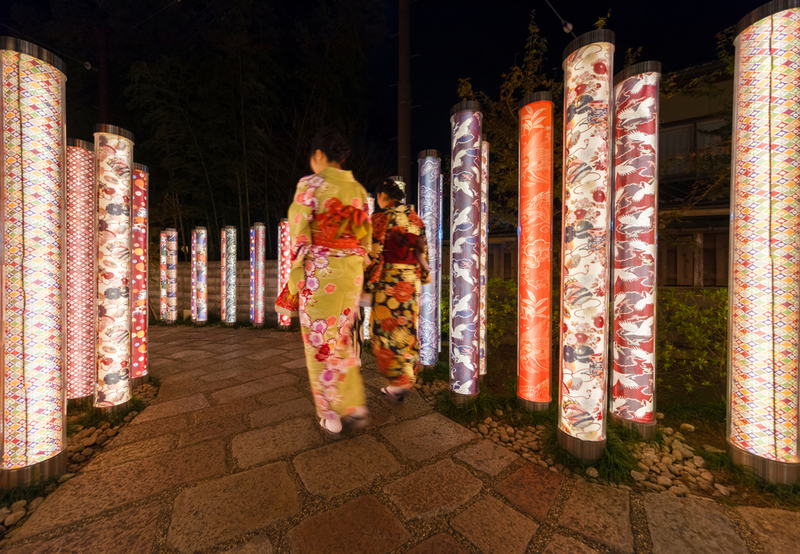 In each December, the bamboo forest is put in illumination and you can see the fantastic and mysterious beauty in the night time. 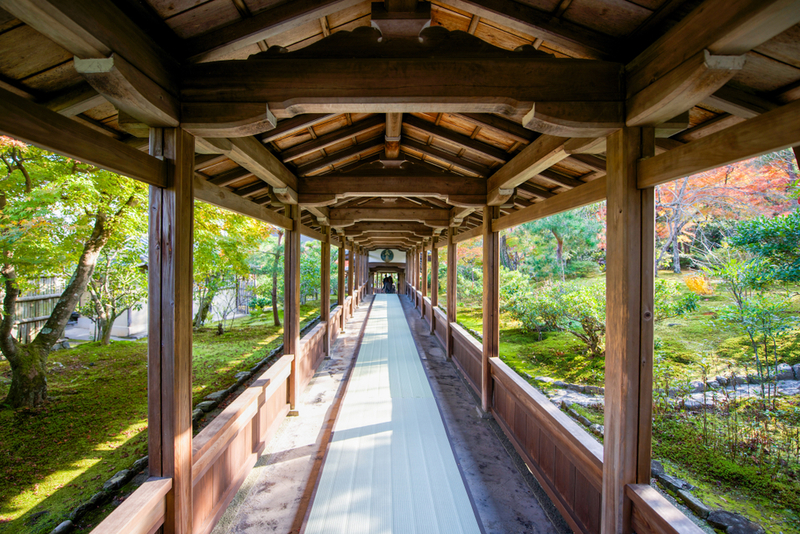 After enjoying a walk in this path, you will enter the Tenryuji temple, one and only World Heritage in Arashiyama. 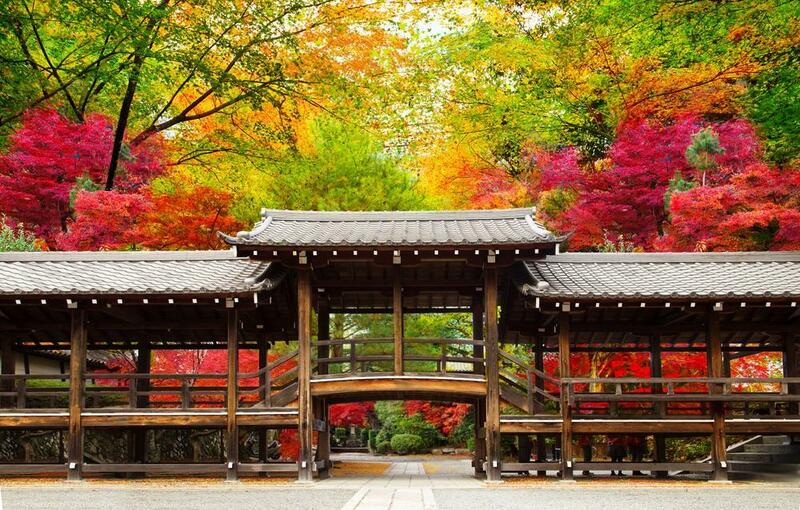 Among the 5 grand temples of Kyoto, the Tenryuji is classified in the highest temple of Zen. The time when the shogun and the emperor fighted and split Japan in two, the shogun built this temple for appeasing the spirit of the emperor when he would win. By consecutive fires, almost all buildings were disappeared today, but by the historic valeur and by its importance, it is classified in the World Heritage. 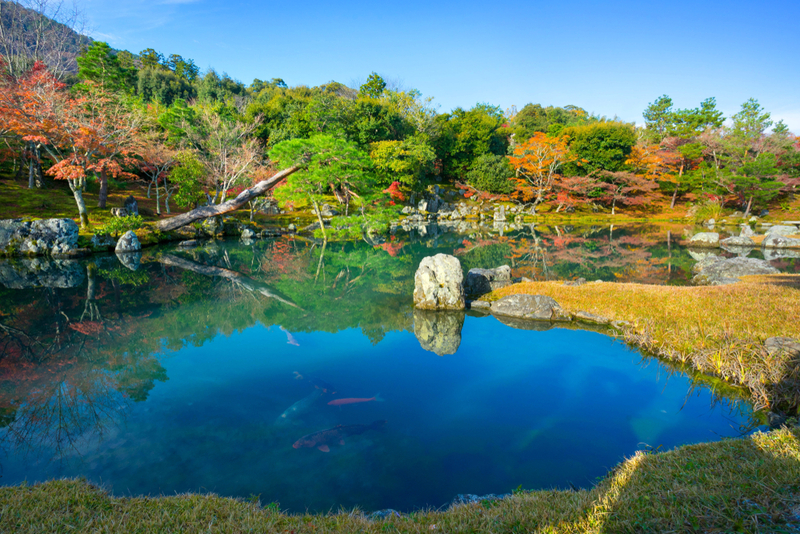 Especially, the garden of Soseki Muso, the first chief priest and the famous architect of the garden and also the Sogenchi pound where you find the beautiful nature on the reflection are the must-see-spots for your Arashiyama visit. 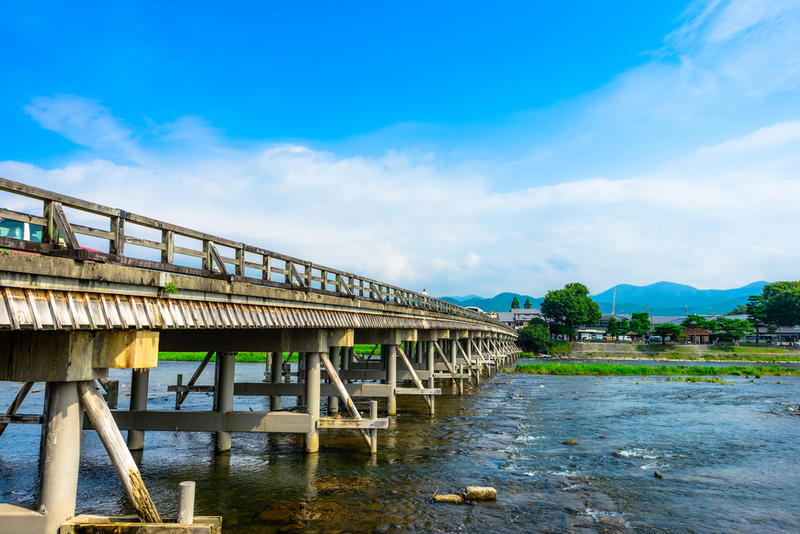 In the west side of Kyoto, on the Katsuragawa river, the Togetsukyo bridge is often mentioned in the guidebook, and it is a symbole of Arashiyama. In Japanese, it is written as "Moon crossing bridge", and when the emperor enjoyed boating, it is seen as if goes the full moon crossing the bridge over the starry sky. This bridge has been built for the first time in 1200 years ago, and it was collapsed every time under flood, and restored many times. 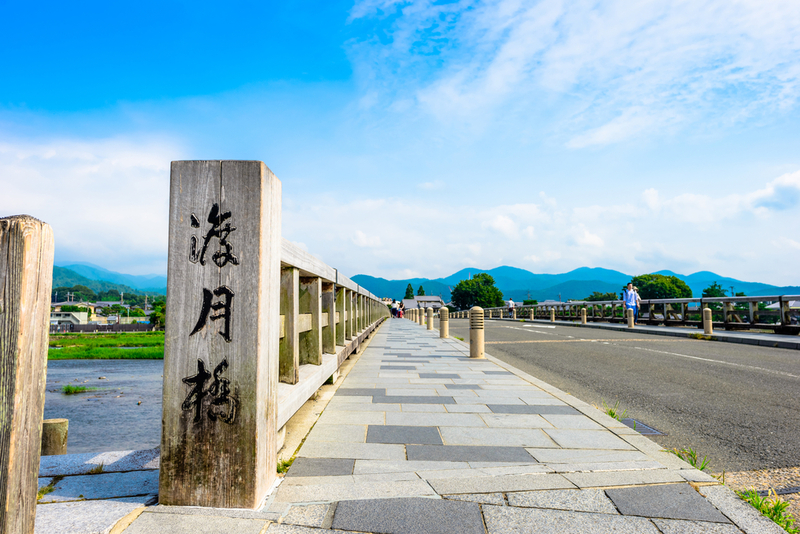 The bridge today is the one which restored in 1934, and it makes beautiful view with the landscape of Arashiyama, and often took photos by tourists. When you cross over the Togetsukyo bridge, there is a shrine and also the entrance of the park. After the ticket counter, going up the stairs and mountain path for 15-20 minutes, you will find the park on the top of the mountain. 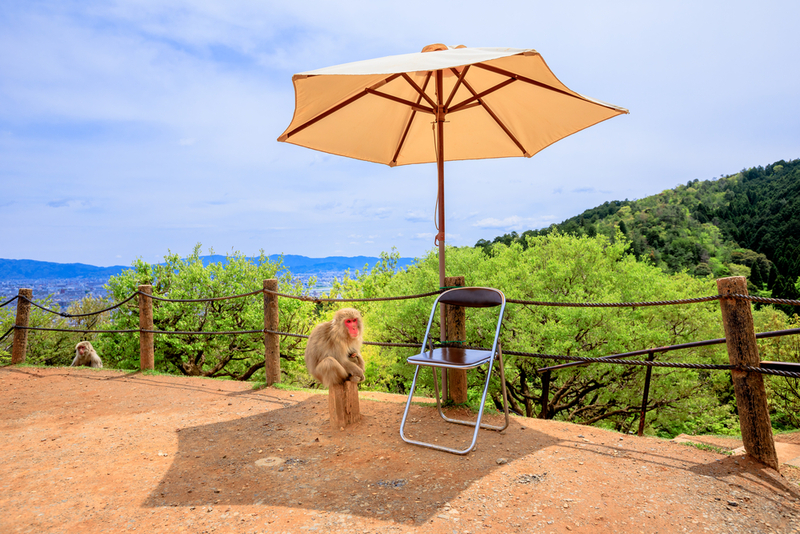 There are around 120 wild monkeys are feeded and you can see them free in the nature. They are tame and do not attack you. In the resting place, you can buy their food by 100yen, and you can geed them over the net. 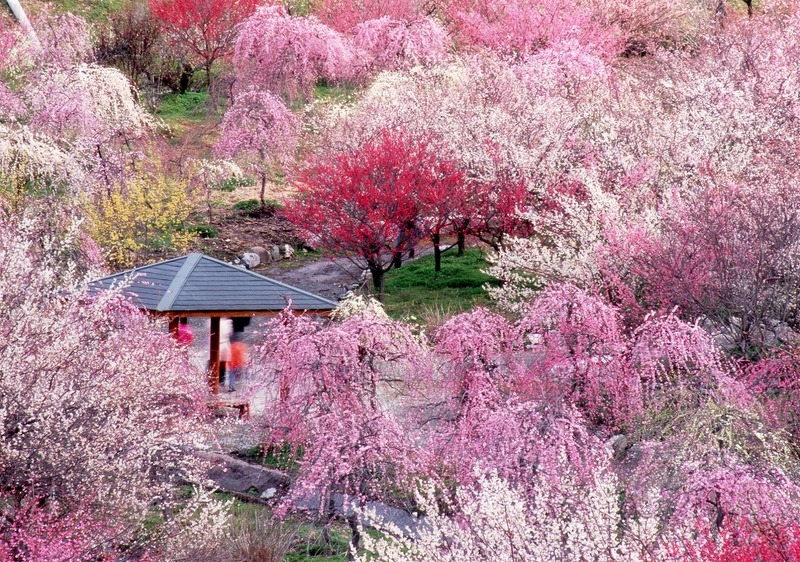 As this park is located in the top of the mountain, so that you can enjoy also the amasing panoramic view of Kyoto. 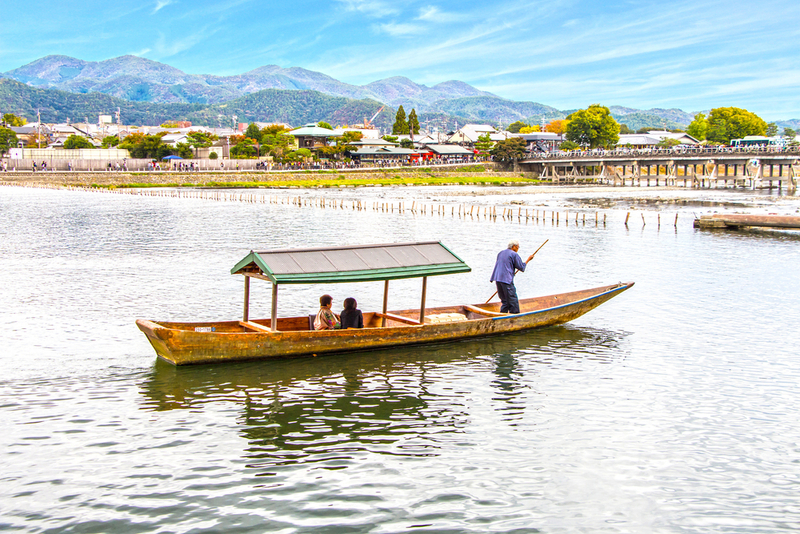 The boating in Arashiyama was an aristocratique hobby since 1200 years. You can enjoy the view from the roofed boat rowed by boatperson. 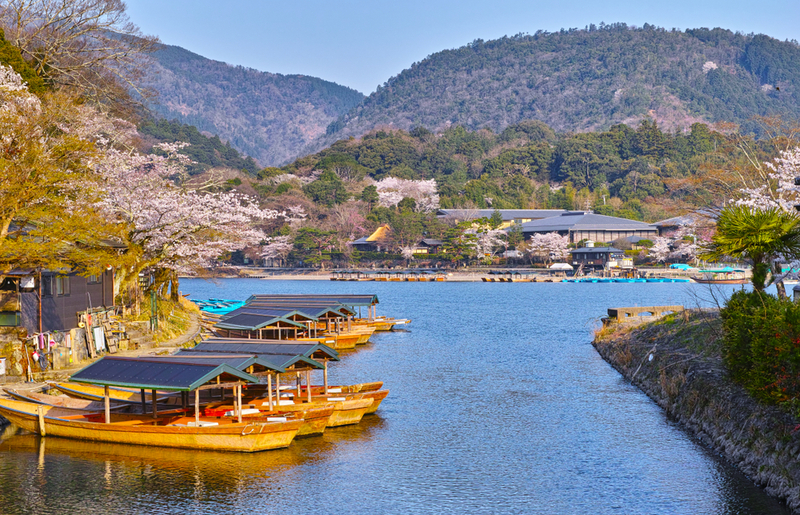 The natural view of each season of Arashiyama that you see from the boat will be magnificent. You can charter a boat for 2 persons. As it is the place very appreciated by tourists, there are many restaurants of Japanese authentic local cuisine, but also there are several Yoshoku (occidental cuisine in Japanese style) restaurants. There are often long queues in front of the restaurants during week-end and in the high season. If you prefer going for a walk instead of making a queue, you can buy some snacks as Dango (Japanese sweets) or croquettes in front of shops of the streets. We can arrange also booking restaurant for you. Please feel free to contact us for this option. The choice of the menu, the type of the restaurant and the prices are depending on the season and dates. We can advise you the details. After the lunch, we will go to take the Randen tram from Arashiyama station. 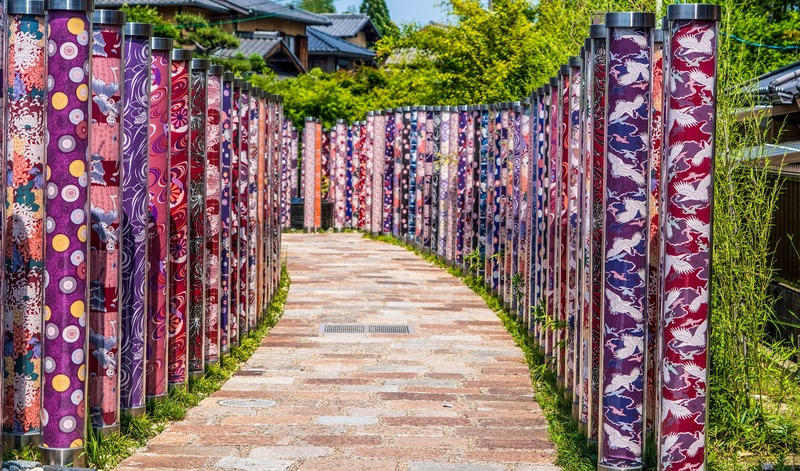 You will see 600 pillars of Kyo-Yuzen (the methode of dyeing technique for kimono invented 300 years ago) designed by a worldwide reputated international interior decorater, Yasumichi Morita. In the night time, the illumination is very fantastic. 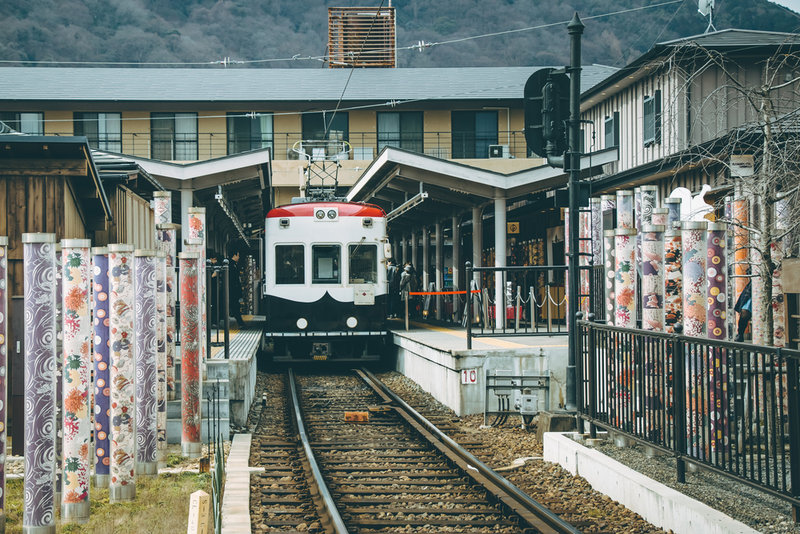 The Arashiyama line of Keifuku electric railroad is known by the name as Randen, and this tram is counted as an important element to compose the Kyoto view. When the automobiles became popular for the private use in 60's, the trams quickly disappeared, but this Randen is still there. It runs in the east side of Kyoto and it goes to Arashiyama, too. The tram is loved by not only the local people but also by tourists. 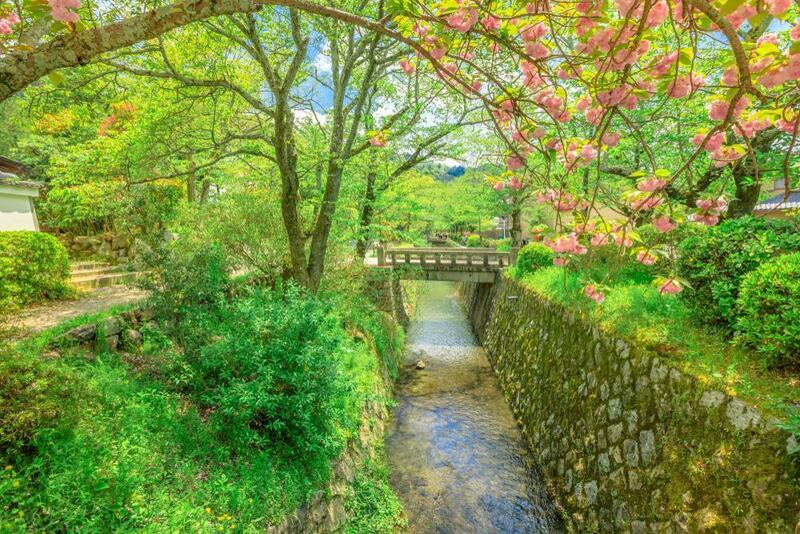 Getting of the Randen at the Ryoanji station, and by several minutes of walking, you will arrive at the Ryoanji temple. 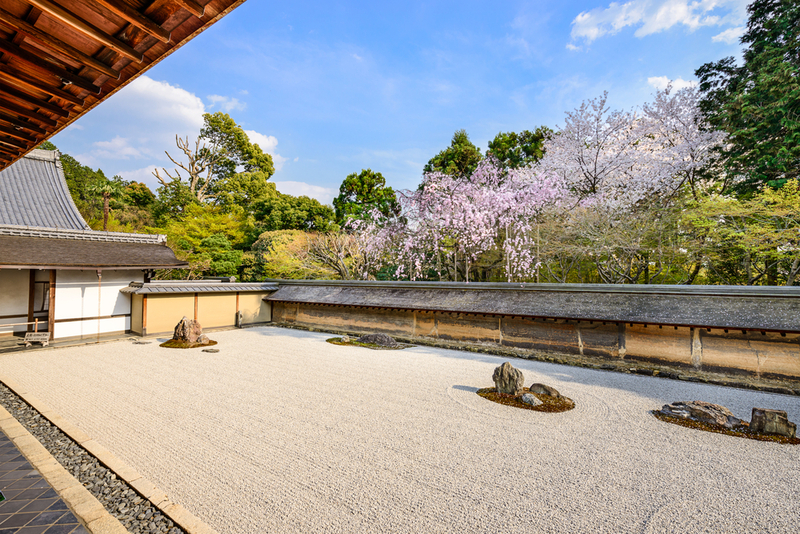 The rock garden of Ryoanji temple of which the dry landscape is appreciated by Elisabeth II very much and since then, this temple drew the focus of public attention from all over the world. 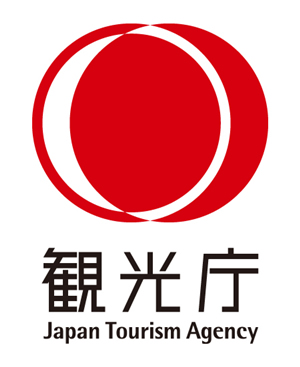 It is now very reknown and it is one of the World Heritage of Kyoto city. 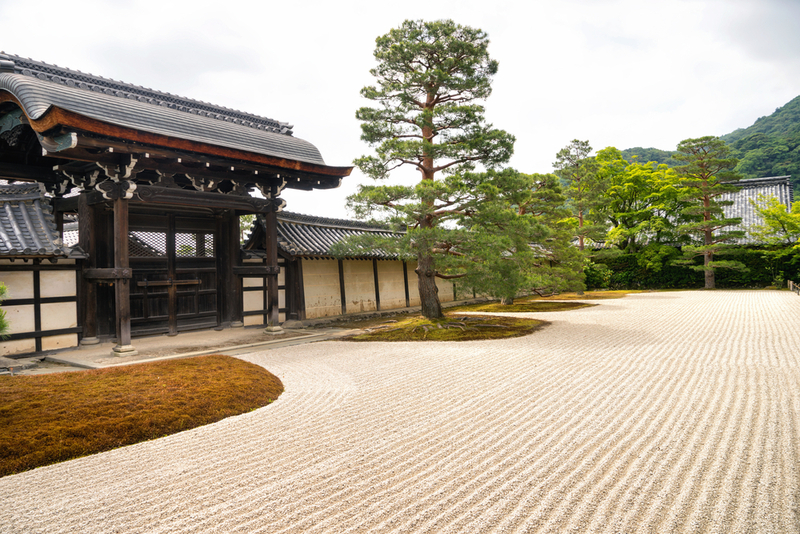 In the rock garden, there are 15 stones are placed, but the entire composition cannot be seen at once from any angle. There are no documents about the history and the architect of the garden exist today, and we do not find exactly when it is constucted either. There is a mystery behind the positions of the stones. There are a lot of people who tried to find out the mystery of the stones, but nobody succeeded. We ofthen talk only about the garden, but there are also beautiful Fusuma-e (decorative picutre on the surface of fusuma which is a kind of Japanese door inside of the house) and another beautiful gardens, too. By a public bus from Ryoanji temple, you will arrive at Kinkakuji temple shortly. 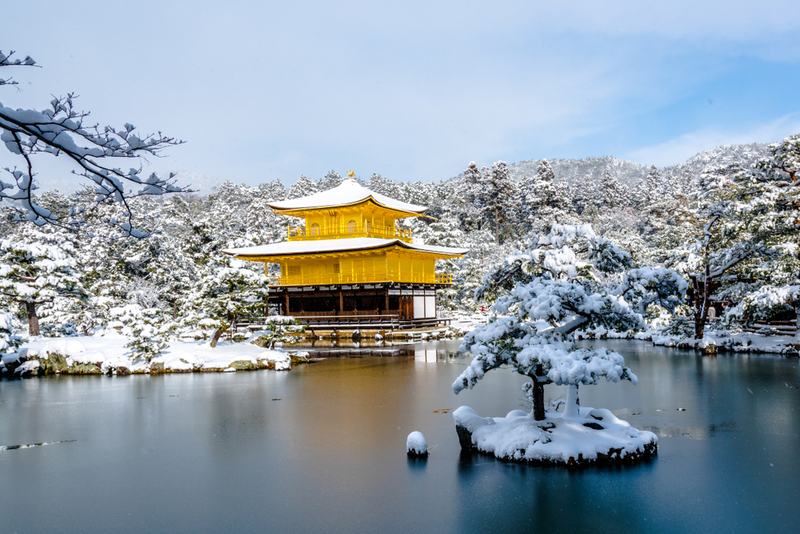 The Kinkakuji temple is the most famous temple in Kyoto, and as it is written in Japanese, it is a gold shining pavillion. It was built in the end of 14th century, and restored many times, but it has been completely destroyed by arson in 1950. The one of today is reconstructed as it has been before originally. The Japanese famous novelist of modern Japanese literature, Yukio Mishima wrote a novel titled "Kinkakuji" which made the temple more well-known, and it shines more with its legend. 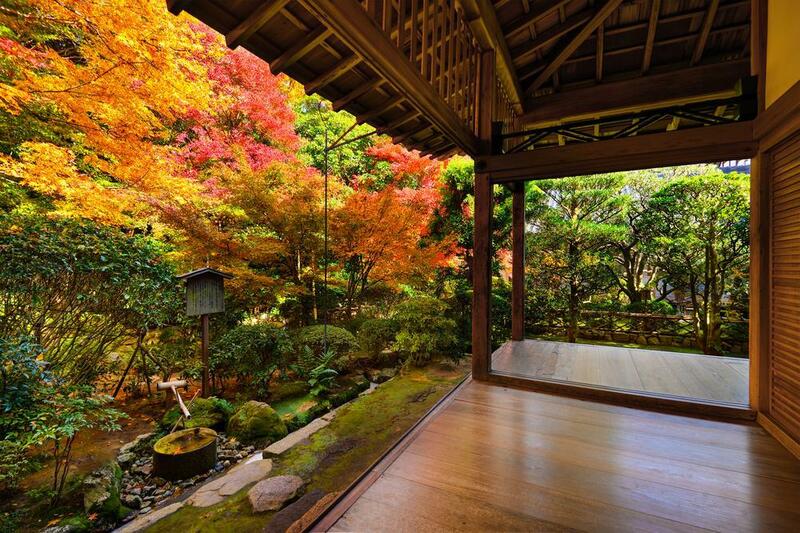 After the visit of Kinkakuji temple, you can also the possibility to participate in a tea ceremony as option. 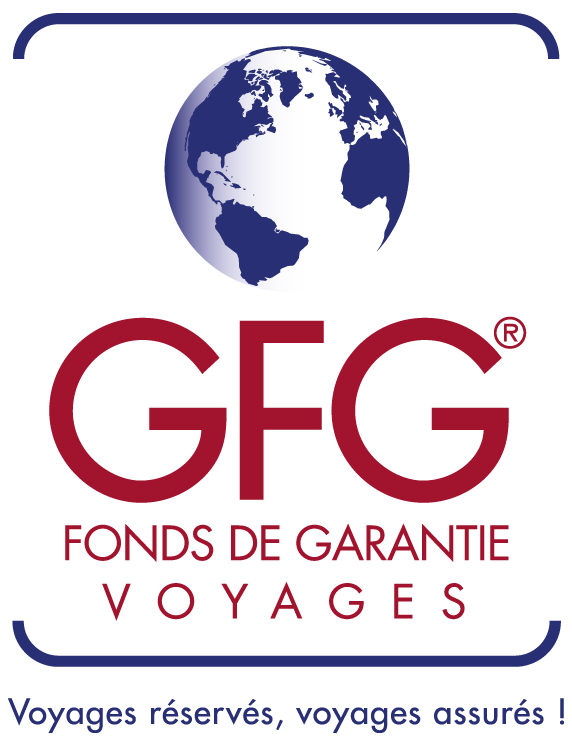 If you prefer not to take this option, your one day trip is finished, and we wish you a bon voyage and a safety trip to your country. From Kinkakuji bus station, you can go to the Kyoto station and to the commecial district (Shijyo kawaramachi) without any transit. If you participate in the tea ceremony, we will accompany with you to the bus station. 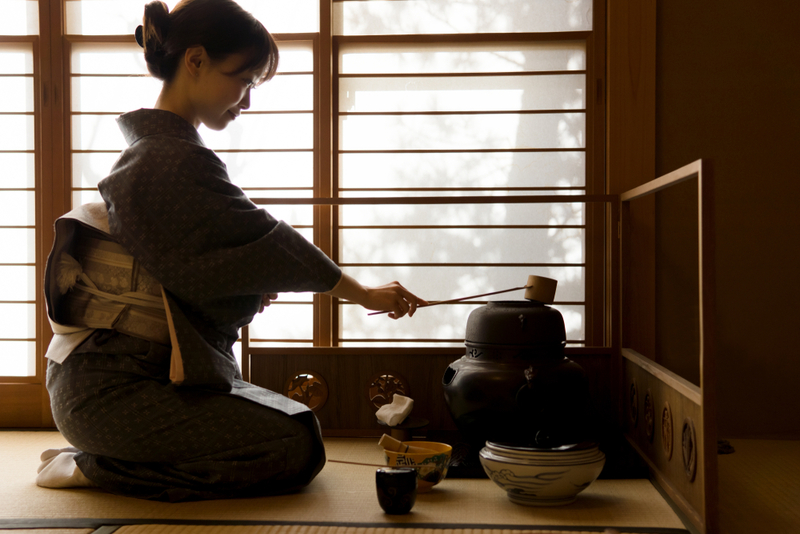 You can learn about the fundamental of the tea ceremony in this class which is located only 1 minute from Kinkakuji. In general, you learn the carriage and manner in the session, and you will taste the tea that the tea master served for you in a tea ceremony class, but in this class, you can make a tea and you can taste it. 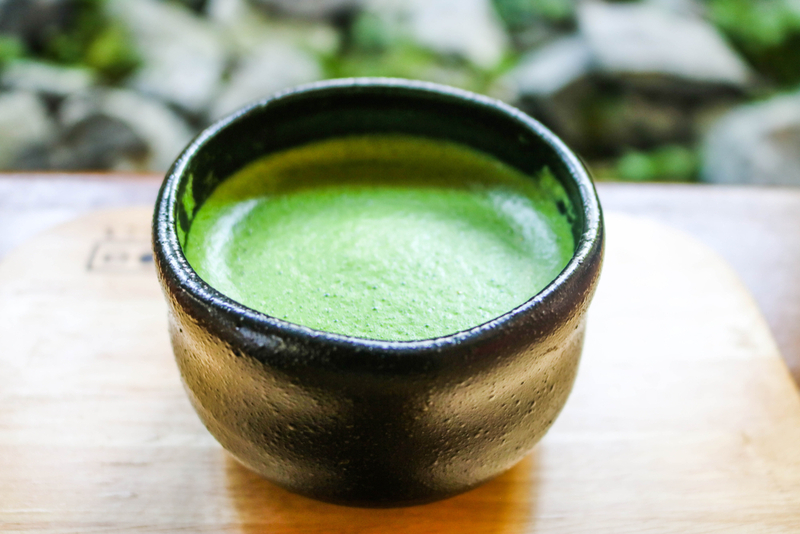 Kyoto is the very central and the leading place for learning tea culture, and this tea class is literally in front of the famous Kinkakuji, this experience will leave you an un forgettable memory. This itinerary includes a moderate amount of walking is involved; please wear comfortable walking shoes.